Over the past year I have collected a mountain of empty products to share with you. I was thinking about filming a video but I thought the best idea would be to break them up into different blog posts and space them out over a few weeks. Therefore, I have four posts waiting for you and they will be going up over the next few weeks. Number 1 is the Urban Decay All Nighter Setting Spray, I have loved this setting spray for a very long time but only ever buy the travel sized bottles as I travel quite a lot and feel the price is worth it. The price for the travel sized edition is only ￡9.00, which is perfect if you feel you need to test the product before you buy it. I believe this spray helps my make up to last like no other! The next empty product is the Una Brennan Micellar Water and I actually have two empty bottles of this. I really like this product for taking my face make-up off but I feel that it does sting my eyes when I try to take any make up off of them. For this reason, I would prefer to use the Bioderma or the La Roche Posy one so will not be repurchasing it. The third item is the Mitchum Advanced Control Deodorant, it's no lie that I can suffer from sweaty underarms and I found this particular product a few months ago. I was attracted to it due to the stick format. It doesn't leave a liquid under my arm but is instantly dry. My only issue is if I don't leave it to dry then it can sometimes leave a white mark on my clothing, but I have tried the one which claims not leave any white marks but felt it did not perform as well. Next is the MAC Studio Fix Powder in the colour NC15. I have no idea how many of these pans I have got through because it's my absolute favourite powder. It not only helps my make up to last, but also provides a bit of coverage. The final empty product I have is a mini version of the Clarins Instant Eye Make Up Remover, I also have two of these that I have used and since finishing these products have gone on to buy the full size version. It's perfect in taking my waterproof mascara off as it doesn't feel like I am having a fight with my eyes. 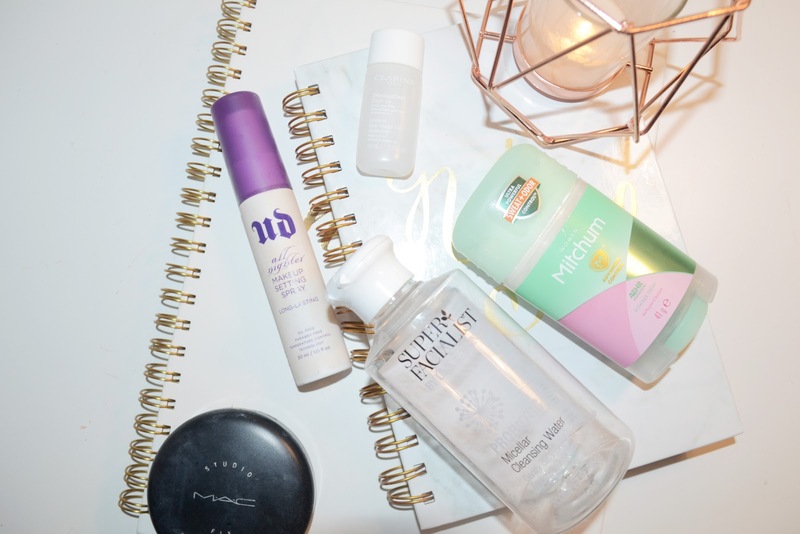 Have you ever tried any of these products? Which product do you run out of the most?